Isn't it time to get off the bank and step into the water? There is an old gospel hymn, sung by the Cathedrals, that goes like this: "Step into the water, wade out a little bit deeper. Wet your feet in the water of his love." This is a very interesting song if you think about it in the context of Scripture. I'm not sure where the writer of the hymn received his inspiration, but the memory of the song came to me as I was reading from the book of Joshua (Joshua 3:1-17) this past week. After forty years of wandering through the wilderness in pursuit of God's promise for a better life, God's people finally are going to get to cross into the Promised Land. God gives Joshua directions explaining what was going to happen. They were to cross the Jordan river during its flood stage and enter the land of Canaan. So when the people broke camp to cross the Jordan, the priests carrying the ark of the covenant went ahead of them. Now the Jordan is at flood stage all during harvest. Yet as soon as the priests who carried the ark reached the Jordan and their feet touched the water's edge, the water from upstream stopped flowing. It piled up in a heap a great distance away, at a town called Adam in the vicinity of Zarethan, while the water flowing down to the Sea of the Arabah (the Salt Sea) was completely cut off. So the people crossed over opposite Jericho. The priests who carried the ark of the covenant of the LORD stood firm on dry ground in the middle of the Jordan, while all Israel passed by until the whole nation had completed the crossing on dry ground (Joshua 3:14-17 NIV). This time God called upon them to literally make a "step of faith" before he would deliver them. He wanted them to display their trust. 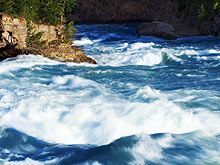 When the soles of the sandals on the feet of the priest touched the water, the water stopped flowing and backed up for approximately seventeen miles upstream. Notice also that the river bed was instantly dry. God worked, but he demanded that the people take a step of faith before they experienced this mighty work in their lives. I wonder how many times God doesn't answer our prayers or doesn't cause or allow something to happen in our lives because he is simply waiting for us to take the first step of faith? What is it that you dream of doing or being for God? What great plan do you have for God or for your life? Are you waiting for the right time to step out, for the perfect conditions to act? God's great writer and preacher of wisdom warned, "He that observeth the wind shall not sow; and he that regardeth the clouds shall not reap" (Ecclesiastes 11:4 KJV). I love the way this message is translated in a newer translation: "If you wait for perfect conditions, you will never get anything done" (NLT). Isn't it time to "Step into the water, wade out a little bit deeper. Wet your feet in the water of his love." "Step into the Water" by Russ Lawson is licensed under a Creative Commons License. Heartlight encourages you to share this material with others in church bulletins, personal emails, and other non-commercial uses. Please see our Usage Guidelines for more information.